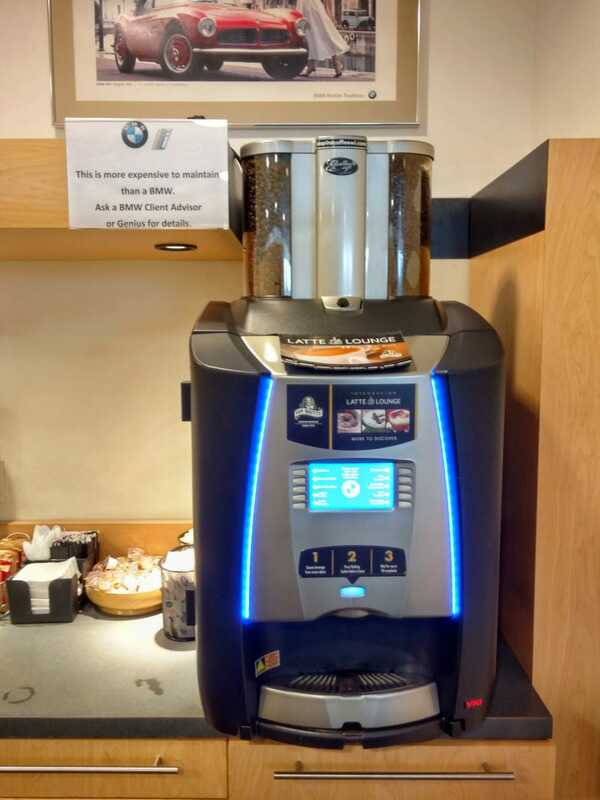 This is the fancy schmancy coffee machine at Zimbrick BMW in Madison, WI. I thoroughly appreciate the sign that indicates the machine is more expensive to maintain than a BMW. I don’t generally take my extensively modified and out-of-warranty BMW to the dealer for service, but last night I accidentally knocked the switch for my power rear sunshade while driving (thanks for putting that button right in front of the shifter, BMW) and when I tried to lower it, it got stuck in the up position. My indy mechanic usually schedules work several days out, and having the shade obscuring my rear view for several days sounded really annoying. So I called the dealer and they said they have a trick for getting the stuck shades back down, stop in to the service bay any time. So here I am, enjoying coffee and a gourmet cookie in front of a festive Christmas tree. Of course, that part is available for about $230 cheaper here, because my local BMW dealer is all about charging full MSRP for parts. That must be a damn expensive-to-maintain coffee machine!